With graduation parties everywhere, it’s time to start thinking about what you’ll be gifting your favorite high school or college graduate. Luckily, The Northwest Company has some great college-themed gear for a university grad who’ll be missing their school or for an incoming college freshman who is ready to rep their new colors! Featuring a large number of universities around the United States, items from The Northwest will make sentimental gifts that grads will love. From beach towels to throw blankets to backpacks and more, the options are truly endless. And if it is Dad you are looking for, look no further! The Northwest Company has NFL, NBA and MLB gear for all of Dad's favorite teams! And if your dad or grad is a Disney fan, then you will also LOVE their selection of Disney gear! 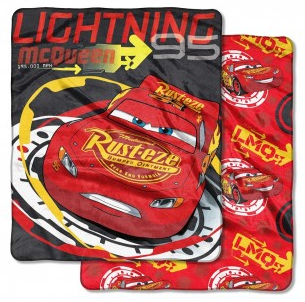 My favorite is the Cars, "LMQ" Double Sided Cloud Throw. It is so soft and comfy - it is great for children (and adults!) of all ages to cuddle up with! You can purchase all items from The Northwest Company website.